The poems in Apprehend (Fence Modern Poets Award 2002) mark a new chapter in the work of Elizabeth Robinson, who over the last few years has quietly, but unmistakably, emerged as the one of the finest poets of her generation. Apprehend amplifies the body of her previous work, with its focus on the crisis of spiritual desire, examining the insurgence, regulation, and ambiguity of eros through a brilliant re-reading of classic fairy tales. Fairy tales, she suggests, act like a subspecies of theology. Their disturbing and uncanny language appeals to our secret longing for solace and disruption. In the space that opens between these two poles we might apprehend, for a moment, the possibility of standing outside the gaze of a history which names us. To enter such a moment, though, is to face a metaphysical terror. The extraordinary accomplishment of this book lies in the way Robinson negotiates that terror by problematizing the discursive mechanism of the fairy tale, its ideological and linguistic functions, even as she retains its classic utopian features, enumerated by Tolkien, of fantasy, recovery, escape and consolation. The poems of Apprehend, like their fairy tale models, re-distribute the tensions between an impossible desire for unmediated presence and the ambiguities and complexities of language. Robinson’s terse, minimalist idiom recalls the work of Niedecker and Oppen, Barbara Guest and Michael Palmer, but it’s an idiom she has made entirely her own through a subtle and exacting deployment of measure and a provocative confrontation with postmodern theology. The scrupulous and tender inquisitions of her earlier work, from In the Sequence of Falling Things to Pure Descent, place her in a small group of contemporary poets (Pam Rehm, Peter O’Leary, Liz Willis, Andrew Joron, Lissa Wolsak, Joseph Donahue, Claudia Keelan and David Miller are a few names that come to mind) whose engagement with the recovery of a radical ontology marks them as some of the most daring poets now writing. By daring, I don’t mean the kind of typographical quirkiness or archly bloviated theory-sprach associated with so much work currently lauded as vanguard. The kind of daring found in Robinson’s poetry evinces a spiritual courage and moral acuity that recalls Simone Weil and Abraham Joshua Heschel. Her deeply informed suspicion of language has not robbed her of an underlying assurance in the hermeneutical circle of meaning. There’s a willingness in her poems to grapple with the aporia of faith and doubt that places her in a line extending from Hadewijch of Brabant and Julian of Norwich to H.D., Robert Duncan and Fanny Howe. In Apprehend, she grafts her concerns with the vexing procedures for the production of meaning onto the libidinal energies of faerie. The illumination she provides reveals a spiritual topography where monstrosity, alienation, and bewilderment are simply the deeper, more troubling forms of a yearning for the other that underwrites the wager we have placed on God. Disruption in these poems, as when the other lays siege to the self – the wolf forcing entry to the pig’s house in ‘Three Little,’ for instance – arrives as smoke and fire, as an invasion of consciousness, as an awful messianic moment in which ‘the arrival is something like naked./ All the excess tarnishes and flares.// We could not welcome you otherwise.’ This tumultuous recognition announces the arrival of the other not as rescuer, but as someone like ourselves, someone from whom, as she writes in ‘Passage,’ ‘salvation is simply an exchange of names.’ Welcome of the Outside, then, proceeds as an enabling loss. The descent of grace into shelter must come as just such an invasion, one that we prepare for paradoxically by resisting it. What’s so movingly at stake in these poems is how the frangible space of loss generates the response that is yearning. The need for belonging in an exquisite order of the articulate means the subject must empty itself in order to be recognized. This is one way, at least, to read the enigmatic drama of ‘Firedrake,’ the second of ‘Three Dragons,’ in which the question of identity and alterity revolves around the uncertain status of a language that constitutes us: ‘Those words most/ besotted with you/ are not those which are most loyal,’ warns Robinson. Here, the dragon tended to by the maiden signifies both the pressure of interpellation and the possibility for the monstrous, that is, the alienated, to give itself in a shape of redemptive eros otherwise known as beauty. Language is the real dragon here, writing on us from outside. Yet despite the sinister ideological forces at work, an uncanny tenderness suffuses this poem. The firedrake and the maiden act as each other’s guardians, as when she peels fruit for ‘his tender fangs.’ Such gestures commit them to a dangerous stance, one in which response exposes them to the risk of intimacy. The discursive prohibition against forgiveness suggests that the gap between them may never be closed, that language will always remain ambiguous, both a threat and an opening to possibility. The poems in Apprehend evince a certain caution about their own condition as poems. There’s a suspicion that words can never be fixed, that they are always in danger of slipping out of one valence to pursue another that is not only alluring, but ominous. The utopian impetus running under everything we say is the desire to be something else while still saying ‘I.’ In the opening section of ‘The Book of Apprehension,’ a poem not deriving from a fairy tale but very much of a piece with the book’s themes, Robinson again displays her unnerving ability to invoke a tone that simultaneously registers uneasiness and devotion. But no one can plumb what I pursue. The crisp authority of these lines sends a shiver down the spine. The struggle of the runner to escape the gravitational field of his creator is a struggle for self-recognition, that is to say, the beginning of a praxis of justice by which I may also recognize others. It marks the introduction of messianic time, as both Derrida and John Caputo call it, the moment in which the recognition of the other enacts a commitment to place justice before truth. Justice stands as the true figure of the impossible apprehension we are always being called to. His face is simple and fine. He makes the onlookers hunger. Taunt is faster than chant. The beautiful runner doubles as taunting angelic messenger, daring us to approach the messianic, and as the recipient himself of the infra-temporal moment in which apprehension about his own position gives way to an apprehending of something greater: a name that is not a name, not a master word, a name rather that says itself from outside the long shadow of the Symbolic. An impossible name. The continual play on this double reading throughout Apprehend produces a powerful tension, a kind of theophanic pressure that instead of disclosing God to the human, reveals the human to God. Isn’t this the real basis for an ethics of the immanent? Dragon or runner – both approach as forms not yet apprehended. Language itself comes near as an inaugural act of violence and as the instrument for negotiating that violence in these spare, cryptic poems, with their dioramas of desire and danger. But danger may not only signify loss; to be in danger, as Holderlin knew, can also mean to be radically broken open to a new possibility for being, midway between hopeful reticence and ardent disclosure. The penultimate sequence in Apprehend, ‘Hansel & Gretel,’ is an austere tour de force, a parable about nourishment and want, abandonment and the coming forward of the human person as one who speaks. In Robinson’s eerie, touching tableau vivant, the two children wander lost amid the dark wood of the Symbolic order, where they must negotiate a jumbled ethical terrain. In this place, repetition, the repeated wanderings through the forest to the site of endless satiety, that fabled house made of sugar, exerts a powerful pressure on language. ‘An old story, told yet again,/ is subject to certain deformations.’ Robinson plays beautifully on these deformations. The messianic asserts itself here again, not as arrival but as the endless project of self-becoming. ‘That there are options even in repetition:/ starvation breeds resourcefulness.’ The story’s infamous kiss between brother and sister here signals a transgression – not incestuous – but instead the moment when the child moves past mere animal appetite to the deeper resources hunger may provide. That moment is the sealing of a pact: the human joining the human. The spiritual hunger that resides in each of us, Robinson shrewdly insinuates, plays the witch to our own cravings, the willing agent to the disclosure of our mutual dependence on one another. As Weil observes in her essay ‘Beauty:’ ‘We want to eat all the other objects of desire. The beautiful is that which we desire without wishing to eat it. We desire that it should be.’ From the pure narcissism of eating the candy house to ‘the certain// unity of the sweet abode’ is not only an ethical step. It partakes of what might be called a eucharistic motion, a movement into the presence of a gift that we are still just learning to receive. But only if we can first learn to see it. they learn skills of recognition. We do not want you to find your way. Love knows... in effect [it] becomes a means of knowledge when our concern is with the other, and no longer with objects ... only charity opens the space where the gaze of the other shines forth ... charity empties its world of itself in order to make place there for what is unlike it. In the same way Robinson’s claims recall Franz Rosenzweig’s notion of redemption as something we can say only in the context of ‘We.’ ‘Where the dual once applied, where someone or something has become neighbor to a soul, there a piece of world has become something which it was not previously: a soul.’ Love limns the traces of the kingdom of belonging where, as Robinson avers (it’s worth repeating), ‘salvation is simply an exchange of names.’ But it’s also bewilderment and terror. Unfounding. The eeriness we feel before words is the estrangement we feel before the face of the other because we do not own it. Nevertheless, estrangement provides the opening. Through its aperture the alien gives way to the recognition of my neighbor. If eating forbidden candy is an act of enchantment, then ‘the certain// unity of the sweet abode’ permits the recognition of the as-yet coming to be. Which, after all, is only what the mother who abandons her children most fervently wishes for her children: to apprehend. To grow apprehensive suggests a restlessness, a trembling before the other, whose approach is also the longed-for outcome. Throughout these poems the other approaches across great distances, at first like a monster, or a wolf, or a witch, to stand in a radical and plangent proximity. Nearness hurts these poems like a heartbreak of continuous affirmation. This is the source of the uncanny in these poems, the way they touch us to the quick, like a ghost with its nerves on fire and speaking the shadow tongue we know as our own hidden murmur. We are lost, we are found, then lost again, but we are never who we were before. Inside the story that is the word itself we make a way for ourselves, lighting a home, preparing its meals, dreaming the dream of shelter and exposure. Robinson articulates the tensions and pauses, the sudden leaps and velocities at work inside the poem as smartly and surely as anyone now writing. Her attention to measure offers innumerable surprises, but does not make a fetish of it, as so many younger writers have, particularly those enamored of the more moribund aspects of the New York School. Surprise, in Robinson’s work, is more than the production of a frisson, of the delicious shiver of the novel. Rather, it inhabits a moral dimension, compelling the reader to see not so much the unexpected connection between X and Y, but to weigh the distance between them, and not as irony would either, but with a care for including everything that distance allows us to see. Everything, in short, that gets left out. Surprise in her work is a kind of caesura, a form of measure, in other words. The work of that measure is one of ethical perception where the distance between lines or stanzas generates contact with, however fleetingly, the most intimate presence, that within the poem which is itself always disappearing. In ‘Whose Monster’s Noise and Weather,’ she limns the traces of that vanishing as a portal through which we must pass every time we speak. Minimalist diction, then, becomes more than a laconic gesture of compression. Robinson’s stanzas map a kind of intimate distance on the page, a distance that generates the emergence of nearness, which of itself comes forward only by resisting disclosure. To become fully present to the sorrow of the world, these poems suggest, means to risk going beyond oneself in ways that are potentially devastating. The gift of her language, therefore, is not one of exfoliation, but of continual scission and concision. A watchful expectancy invests these poems as though their very lives depended upon it. Apprehend testifies to the body’s thirsts and fevers, to the intransigence of our hunger and the assuagements of eros. Above all, these poems signify, with tremendous passion and elegance, that we are always alone in language – and never alone in language; that the poem is the guarded site where the secret of redemption that resides at the heart of relationality may unfold. This is why these oblique narratives come bearing both a solace and a burden. They are dark allegories of the heart, disclosing a poignant phenomenology of the everyday, a poetics of yearning and risk that charts the struggle of eros to take up the task of being, which is always greater and more demanding than the task of merely living. Robinson’s wisdom is to acknowledge that what we ask of the poem, as of the fairy tale, is that it affirms for us that yes, the world is broken, but that nevertheless, we are somehow safe inside of it. Elizabeth Robinson was educated at Bard College, Brown University, and Pacific School of Religion. Her previous books include In the Sequence of Falling Things, Bed of Lists, House Made of Silver, and Harrow. She has been a MacDowell Colony Fellow and a National Poetry Series Winner for Pure Descent. Her work was included in The Best American Poetry of 2002. She co-edits EtherDome Press, 26 Magazine, and Instance Press, and lives in Berkeley, California, with her family. Patrick Pritchett is the author of Reside (Dead Metaphor Press, 1999). His book-length poem on Joan of Arc, Burn, will be published by Chax Press in 2003. 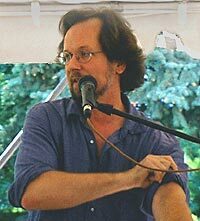 He is a contributing editor for the poetry journal Facture and has taught at Naropa University’s Summer Writing Program.